The Neutron Powder Diffractometer (NPDF) is a high-resolution total-scattering powder diffractometer located at Flight Path 1. The Neutron Powder Diffractometer (NPDF) is a high-resolution total-scattering powder diffractometer located at Flight Path 1, 32 meters from the spallation neutron target. 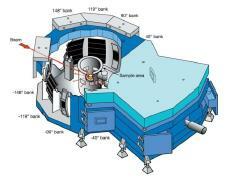 It has 20 detector panels with 160 position-sensitive detectors in the backscattering region of the instrument. These specifications give the instrument a high resolution and a large Q-range, and together with low and stable background scattering, position NPDF as a world-leader in pair distribution function (PDF) studies of disordered and nanocrystalline materials. A standard data set suitable for PDF analysis can be obtained in only two hours. NPDF is equally well-suited for high-resolution crystallographic studies. 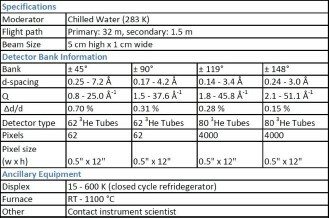 NPDF experiments have resulted in more than 110 peer-reviewed journal articles since the instrument shutter opened in 2002, in fields as diverse as geochemistry, actinide research, complex oxides, bulk metallic glasses, and hydrogen storage materials. Additionally, NPDF serves a key role as a development platform for local structure analysis. 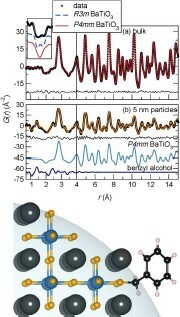 Fits for (a) bulk BaTiO3 and (b) 5 nm particles of BaTiO3 data. NPDF provides access to both the oxide and ligand structure of the nanoparticles. PDF of Nickel extending out to a distance of r = 100 Å.